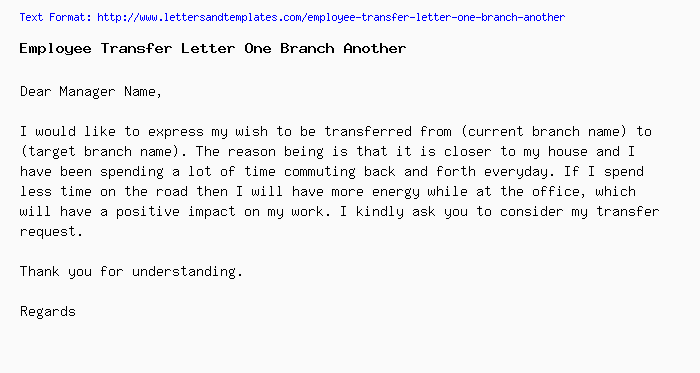 I would like to express my wish to be transferred from (current branch name) to (target branch name). The reason being is that it is closer to my house and I have been spending a lot of time commuting back and forth everyday. If I spend less time on the road then I will have more energy while at the office, which will have a positive impact on my work. I kindly ask you to consider my transfer request. We would to inform you that you will be transferred from [current branch name] to [target branch name] starting from [some date]. You are one of our top talents and we need all the expertise in the newly established branch. This transfer comprises a substantial push given the enormous progress opportunities there. We are confident that you will enjoy your new work environment. Wish you the best of luck.